What is going on in Europe? In this book a number of outstanding Jungian Analysts explore the Cultural Complexes and Identities of their European homelands and nations. This is a new approach to old questions: What makes a people feel at home? How do their traditions and narratives form a cultural Self and identity? How do they differ from one another? Exploring cultural complexes as a part of answering these important questions requires knowledge of history, economics, sociology, anthropology, geography, psychology, religious studies, literature and poetry. But as every complex is built around an emotional core, the study of how cultural complexes live in the psyche is not limited to these disciplines. Each author and reader engages in a confrontation with their emotions, prejudices, and projections. The shape that the ideas and feelings of a cultural complex take in the psyche can be inchoate, rapidly shifting and yet paradoxically long standing, and often quite immune and impermeable to the reason that traditional disciplines of thought would impose on them. These cultural complexes do not necessarily provide a coherent or linear sequencing of facts and events because that is not how they actually exist and function in the psyche of individuals and groups. At the same time, cultural complexes shape what it means to be a citizen of a particular city, region, or country of Europe. They contribute to Europe’s Many Souls. My parents never met in Germany. At thirteen, my mother was thrown out of the illusion of enlightened Mosaic assimilation. The light was turned off, crashing into the black hole of shattered glass at Kristallnacht, walking through the night in the streets of her childhood’s Hamburg. She never really arrived at morning’s light, perhaps because she didn’t meet Dr. Brod. For the rest of her life, she would wait for him, always prepared, dressed up for his arrival. My father, a broken link in a long chain of rabbis, crossed Nazi Germany on his way to work on a farm. He was saved by an unknown, righteous officer at the Gestapo HQ, who shouted at him that German word, which otherwise evokes such horrendous connotations—herauss, get out! And so I learned that just like evil dwells in all of us, the spark of goodness may be found in evil’s darkest cellar. My father was a man who set out on his road but never arrived at his destination. Thrown into disarray by the losses, his mother turned into the ashes of Auschwitz, his grandmother dying in Theresienstadt’s shadow of deception, he tried to create a life for his offspring. On his way to the kibbutz in the Land of Israel, his wings had lost their wind and his legs, stifled into clay, remained stuck in the charred earth of Europe. Qualities of passion and intellectual coherence co-exist in this extraordinary book, itself a product of history, politics, psychology and—often—personal experience and suffering. But what about the timing? Europe is in its deepest crisis since the Second World War and, in the absence of any credible solutions from conventional politics, depth psychology and the idea of cultural complexes are entitled to step into the breach. There is more: By assembling authors from so many different nations, Joerg Rasche and Tom Singer have created a special European union before our very eyes. They, and their stellar team of authors, have not only analysed the continental lines of conflict and war, but have also made noteworthy contributions to the achievement of peace-in-diversity. PROFESSOR ANDREW SAMUELS, AUTHOR OF A NEW THERAPY FOR POLITICS? This is a remarkable and original book and should be read by all those interested in Europe from historical, personal and cultural perspectives, including the roots of European conflicts and their implications for present-day issues. 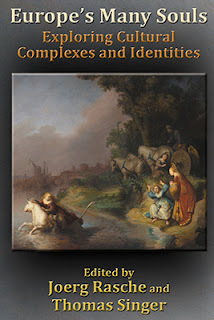 The authors are Jungian analysts or academics from different parts of Europe, and the book’s theoretical underpinning is the concept of cultural complexes, exploring their relevance, dynamics, positive and shadow aspects in individual countries. The editors, Joerg Rasche and Thomas Singer, and the publisher, Spring Journal Books, are to be congratulated for their vision in publishing at this time a book of high quality essays when contemporary Europe is in flux: struggling with its identity; with who belongs and who is excluded; with managing more flexible boundaries, especially challenging with the huge influx of refugees seeking sanctuary in European countries. JAN WIENER, DIRECTOR OF TRAINING, SOCIETY OF ANALYTICAL PSYCHOLOGY, LONDON; FORMER CO-CHAIR OF THE IAAP, EDUCATION COMMITTEE WITH RESPONSIBILITY FOR EASTERN EUROPE. This book on Europe and its cultural complexes is both profound and perfectly timed. The individual articles are outstandingly written by authors who have a deep understanding of Jung and analytical psychology, and know how to connect that knowledge with the problems that Europe faces today. The viewpoints represented are essential to understanding the history of the different European countries and helpful in understanding why they are in such turmoil now. I highly recommend it. THOMAS B. KIRSCH, FORMER PRESIDENT OF THE INTERNATIONAL ASSOCIATION FOR ANALYTICAL PSYCHOLOGY. BETWEEN KAFKA AND MEYRINK: WHY DIDN’T JOSEF K. GET TO THE CASTLE AND WHY DID ATHANASIUS PERNATH ENTER A ROOM WITHOUT A DOOR? IS THE REPLACEMENT CHILD PART OF A CULTURAL COMPLEX IN THE EUROPEAN PSYCHE? Thomas Singer, M.D. is a Jungian analyst and psychiatrist. After studying religion and European literature at Princeton University, he graduated from Yale Medical School and later trained at Dartmouth Medical Center and the C. G. Jung Institute of San Francisco. Dr. Singer is editor of The Analytical Psychology and Contemporary Cultural Series for Spring Journal Books, where he has developed a series of volumes exploring cultural complexes around the world. He is current President of National ARAS, an archive of symbolic imagery (ARAS.org). His writings include articles on Jungian theory, politics, and psychology, and he has written and/or edited the following books:Who’s the Patient Here? (Oxford University Press, 1978, with Stuart Copans), A Fan’s Guide to Baseball Fever (Elijim Publications, 1991, with Stuart Copans), The Vision Thing (Routledge, 2000),The Cultural Complex (Routledge, 2004, with Samuel Kimbles), Initiation: The Living Reality of An Archetype (Routledge, 2007, with Thomas Kirsch and Virginia Beane Rutter), Psyche and the City(Spring, 2010), Ancient Greece, Modern Psyche: Archetypes in the Making (Spring, 2011, with Virginia Beane Rutter), Placing Psyche: Exploring Cultural Complexes in Australia (Spring, 2011),Listening to Latin America (Spring, 2012), and Ancient Greece, Modern Psyche: Archetypes Evolving (Routledge, 2015, with Virginia Beane Rutter). Dr. Joerg Rasche, Jungian analyst, trained in Berlin and Zurich where he studied sandplay therapy with Dora Kalff. Dr. Rasche is a child psychiatrist, working in private practice in Berlin. He served for many years as president of the German Jungian Association (DGAP) and was vice-president of IAAP. Currently he is president of the German Association for Sandplay Therapy (DGST). Also a trained musician, he has published many papers and some books on mythology, music, sandplay therapy, and analytical psychology, as well as serving on the board of various Jungian journals. Dr. Rasche has taught in Central European countries for many years and is a training analyst for IAAP. Dr. Rasche was honored for his work on reconciliation between the Polish and German people by the Polish President who presented him with the Golden Cross of Merit. He gives concerts and lectures around the world. He is married and has three adult children. Jules Cashford studied philosophy and literature, and trained with the Association of Jungian Analysts, in London. Her books include The Moon: Myth and Image, The Mysteries of Osiris, a translation of The Homeric Hymns, and, co-authored, The Myth of the Goddess. She has made two films on Jan van Eyck. Evangelos Tsempelis grew up in Athens, Greece. Co-founder of Stillpoint Spaces (www.stillpointspaces.com), Evangelos currently lives in Zürich, where he works in private practice as a psychoanalytic counselor. Elena Volodina (IAAP, RSAP) lives and works in Moscow, Russia, where she maintains a practice as a Jungian analyst. She is a senior lecturer in the Department of Analytical Psychology at the State Academic University of Humanitarian Sciences in Moscow. She also serves as a visiting/teaching analyst for the Bulgarian Jungian Developing Group. Olivia del Castillo (Spain) is a clinical psychologist, training analyst, supervisor, and former president of SEPA. She is actively involved in teaching and disseminating analytical psychology in Spain and in writing and publishing articles. Ms. del Castillo is in private practice in Barcelona and Madrid. Martin Skála is a Jungian analyst and supervisor who studied psychology at the Charles University in Prague, in the former Czechoslovakia. He is a board member of the Czech Society for Analytical Psychology and a member of the International Association for Analytical Psychology. He also serves as head of Psychopompos, a center of depth psychology in Prague where he lectures and offers workshops. Malgorzata Kalinowska is a Jungian analyst (IAAP IM) and a founding member of the Polish Association for Jungian Analysis. She works in private practice in Czeladz, Poland. Malgorzata studies relationships between trauma and culture, especially in the context of Central European history. She focuses on the transcultural dimension of analytical training and translates books on analytical psychology into Polish. Angela Graf-Nold, Ph.D., born in Freiburg i. Br./Germany, has lived with her Swiss husband and family in Zürich since 1974. She studied psychology at the University of Zürich, specializing in the history of psychology and psychotherapy, especially in Switzerland. She held several research positions in various departments at the University of Zürich, including the Department for Child Psychiatry and the Psychiatric Clinic (Burghölzli); from 2004–2010, and she worked as a researcher and Philemon scholar at the Institute for Medical History at the University of Zürich on the edition of C. G. Jung’s lectures at the ETH (Swiss Federal Institute) Zürich. She is also a licensed psychotherapist in private practice. Her publications include a history of child psychoanalysis (Der Fall Hermine v. Hug-Hellmuth: A History of Early Child Psychoanalysis, Verl. Intern Psychoanalyse, 1988), as well as book chapters and articles about Sabina Spielrein and other controversies and debates about Freud and Jung with other pioneering academic psychiatrists and scientists of their time. Gert Sauer is a psychotherapist and Jungian psychoanalyst who likes to wonder about the miracles of the human, animal, and cosmic psyche. He harbors the sometimes crazy notion that there are issues in individual and collective crises that can be understood by persistent, careful attention. Desperately fighting with his own and others’ blindness, Gert Sauer works and teaches in Freiburg, Germany, as well serving as a senior analyst and supervisor at the Institute for Analytical Psychology in Stuttgart. He has been married for fifty years to Rodtraud, with whom he has three children and five grandchildren. Gert and Rodtraud support the development of analytical psychology in Eastern Europe in the hopes of increasing Western understanding of Eastern Europe and Eastern understanding of Western Europe. Marijana Popović, Ph.D., is a clinical psychologist, psychotherapist, and supervisor, as well as a member of the International Association for Analytical Psychology. Her Ph.D. dissertation was on the use of fairytales in psychotherapy. She is a member of the European Association of Psychotherapists (EAP) and a member of a Serbian Developing Group. Since 1998, she has worked in the field of psychological assessment and psychotherapy, and she translates Jungian literature from English to Serbian. Jelena Sladojević Matić, Ph.D., is a clinical psychologist, psychotherapist, and supervisor, as well as a member of the International Association for Analytical Psychology. Her Ph.D. dissertation was on “The Shadow and Its Importance in Analytical, Therapeutic and Diagnostic Work.” She is a member of the European Association of Psychotherapists (EAP) and a former president of the Serbian Developing Group. Since 2000 she has worked as a psychotherapist in private practice. Pia Skogemann is a Jungian analyst in private practice in Denmark. She has an M.A. in religion from the University of Copenhagen and is a founding member, teacher, and supervisor at the C. G. Jung Institute Copenhagen. She is the author of numerous articles and books, including Where the Shadows Lie (Chiron, 2009) and The Double Coniunjctio Tales (Daimon, Schweiz, 2013). Caterina Vezzoli is a Jungian analyst in private practice, living and working in Milan. She is a member of CIPA Southern Institute, a training analyst at C. G. Jung Institute Zürich, and a visiting supervisor in Tunisia. She is a teacher and supervisor at different institutions and at the University of Milan. Maria Kendler, originally Austrian, studied German literature at the University of Vienna and worked as a high-school teacher for several years. In 1994, she moved to Switzerland, studied psychology at the University of Lausanne, and today is a psychotherapist in a private practice. Maria Kendler practices and teaches sandplay therapy in several European countries. Currently, she is president of the Swiss Sandplay Society (SGSST) and is editor of Sandspiel-Therapie, the Swiss-German journal for sandplay therapy. Marta Tibaldi is a Jungian analyst of the Associazione Italiana di Psicologia Analitica (AIPA) and of the International Association for Analytical Psychology (IAAP). A training analyst and supervisor in Rome and Hong Kong, she is also Training Supervisor of C. G. Jung Zurich and Liaison Person of the IAAP Developing Group in Hong Kong. She is the author of many articles and essays. Her recent publications include Oltre il cancro: Trasformare creativamente la malattia che temiamo di più(Moretti &amp; Vitali, 2010) and Pratica dell’immaginazione attiva (La Lepre, 2011). She is the author of the blog “C. G. Jung’s Analytical Psychology between Italy and China” (http//: martatibaldi.blogspot.com). Erel Shalit is a Jungian psychoanalyst in Israel and past president of the Israel Society of Analytical Psychology. He is Founding Director of the Analytical Psychotherapy Program at Bar-Ilan University. He chaired the Jung-Neumann Conference in 2015 and has authored several books, among themThe Cycle of Life; Requiem; Enemy, Cripple, Beggar; and The Hero and His Shadow. He edited, with Nancy Swift Furlotti, The Dream and Its Amplification, and with Murray Stein, Turbulent Times, Creative Minds—Erich Neumann and C. G. Jung in Relationship. Kristina Schellinski, M.A., in Political Science/Literature, graduated from the C. G. Jung Institute in Küsnacht, Switzerland. She is a teaching analyst/supervisor with ISAP, Zürich and a member of the C. G. Jung Institute, and she served as an International Civil Servant for UNICEF from 1983 to 1998. Schellinski has a private practice in Geneva and is a consultant supervisor with the Geneva University Hospital Department of Psychiatry. She has published in international journals and is currently writing a book on the replacement child.